The U.S. National Transportation Safety Board issued four additional safety recommendations in the wake of a non-fatal ATR-42 accident at Lubbock Airport, TX in 2009. The NTSB recommends to revise the stick pusher’s activation angle of attack (AOA) on ATR 42-series airplanes. On January 27, 2009, an ATR 42-320 operating as Empire Airlines flight 8284, was on an instrument approach when it crashed short of the runway at Lubbock-Preston Smith International Airport, Texas. The captain sustained serious injuries, and the first officer sustained minor injuries. 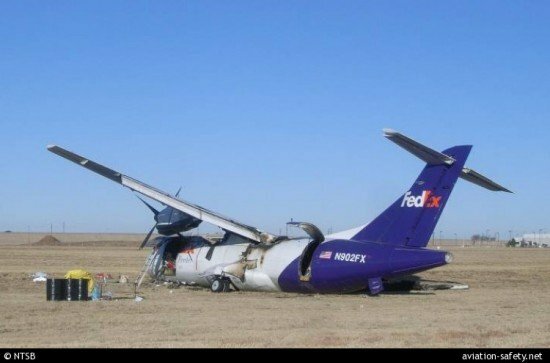 The airplane was substantially damaged. before an uncommanded roll develops during stall. Require that Avions de Transport Régional (ATR) 42-series airplanes operating in the United States incorporate a revised stick pusher activation angle of attack (AOA), such that the stick pusher activates before the stall AOA in the presence of airframe ice accretions. Evaluate all U.S.-certificated transport-category airplanes equipped with stick pushers to ensure that the stick pusher activates at an angle of attack that will provide adequate stall protection in the presence of airframe ice accretions. Require Avions de Transport Régional (ATR) to revise the stick pusher’s activation angle of attack (AOA) on ATR 42-series airplanes to ensure that the stick pusher activates before the stall AOA in the presence of airframe ice accretions. Evaluate all European Aviation Safety Agency-certificated transport-category airplanes equipped with stick pushers to ensure that the stick pusher activates at an angle of attack that will provide adequate stall protection in the presence of airframe ice accretions.